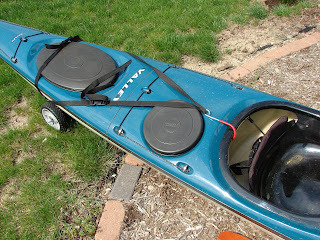 When we speak of larger kayaks, and know that we will need to transport them, it is a kayak dolly that does the trick. 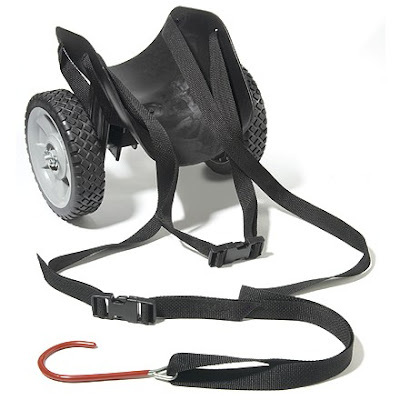 I posted to peers and was recommended this Quantum brand kayak dolly for convenience. I will need to take my sectional down the street to the boat lanch after assembling it at my condominium; this cart is ideal. Low profile, I can easily pull the wheel pins and place the entire dolly in my dry hatch. It functions well, and does not slip off the boat thanks to the red hook that hooks over the cockpit coaming. I recommend this dolly, in particular for flat paved or hard packed surfaces, for hauling your put-together kayak. Available at REI and other online retailers. I have used this cart for more than 3 years, and have concluded that I would be not be in paddlesports if it were not for this cart to help me handle the boat on land all by myself. It seems very well-designed and is so easy to attach and remove from my kayak. The cart even makes loading and unloading the kayak from my vehicle roof easy to do because of the stern mounting location. The cart is so compact and lightweight that it stows under my rear hatch or under the deck. The wheels are bullet-proof and large enough to go over rocks, sand, or rough terrain when walking the boat to the launch. The sleeve bearings and spacers are such that they will not lock-up from sand and grit, and show no wear at all after frequent use for a long time. The flexible, molded cradle conforms nicely to the shape of my kayak hull, and has never left any marks on the boat hull. It attaches on the stern, where the polyethylene boat hull is strongest. I just load everything I need for the trip into the cockpit and make one trip from the car to the water and back while carrying no more than half the weight of the boat and contents.I think this is a great, useful product and can think of nothing that would improve the design or utility of it. I highly recommend it.